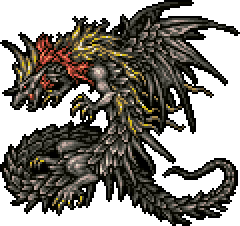 As the imp mentioned after finishing the Dragon's Den, your final, final Final Final Fantasy VI challenge has been unlocked on an island just west of Mobliz. Stock up on Ethers and set up a party of four that can cause lots of devastation in short periods of time. Also take into consideration immunity to elements: Equipment like the Paladin's Shield, Minerva Bustier, Snow Scarf, and Cat-Ear Hood are fantastic for this dungeon, as is the Aegis Shield. Everybody should have a Ribbon unless you need two free Relic slots for a Soul of Thamasa/ Celestriad combination, which is the only combination that you should consider using in this dungeon. Genji Glove/ Master's Scroll is overkill with the Quick spell. When you're ready, land on the medium-sized island just off the coast west of Mobliz. A ghost inside will explain the Soul Shrine. You will fight 128 battles nearly in a row - every so often you'll have a scheduled break in battle where you can prepare for the next wave or leave. If you leave during one of the breaks, however, you'll have to start all over again when you re-enter. The order of battles remains the same, though there is a chance that you might fight an alternate battle instead of a regular one at certain points. In these cases, it will either be an encounter from the Soul Shrine, which could be regular enemies or even bosses, or one of four new enemies called Glutturns. If you have reached a battle that contains an alternate, you will get the "normal" battle 75% of the time with the alternate battle filling the last 25%. Each Glutturn will demand an item. If you don't cough it up, the Glutturn will begin to throw powerful attacks at you. They've got lots of health and also have excellent items to steal. Giving them the items is not recommended, because first, their tendency to flee would likely end up costing you several of each item, and also they give 50,000 experience and 100,000 gil if you defeat them. Will you need that by the time you get here? Sure, why not! The Glutturn (Ether) will throw tons of attacks all in a row at you if you don't feed it, so make sure everyone has the Protect status. Summoning the Golem esper is a big help as well. Stay on top of your healing here. You can steal a Force Shield from it. The Glutturn (Hi-Ether) will use tons and tons of instant-death attacks, so prepare with Reraise and always have people standing by to heal. This is the most difficult of all the Glutturns, but you can steal a Celestriad from it. The Glutturn (X-Ether) will use lots of status effects against you, but everyone should already be equipped with a Ribbon. This is the easiest of all the Glutturns simply because of this fact. You can steal a Master's Scroll from it. The Glutturn (Elixir) will launch Ultima after Ultima at your party and will do around 6,000 damage to everybody. If you have every other party member always use Curaga, you should be able to avoid taking two attacks in a row. Don't waste turns on Reraise against him, because they will be revived just long enough to take another Ultima, meaning your turn was wasted. You can steal a Soul of Thamasa from it.